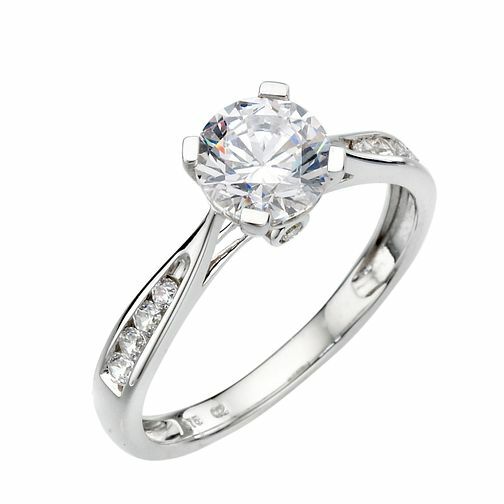 A striking cubic zirconia solitaire ring crafted in elegant 9ct white gold for a fresh and contemporary feel. Stone-set shoulders add an extra touch of glamour. Capture her attention with this elegant ring. 9ct white gold cubic zirconia solitaire ring is rated 5.0 out of 5 by 5. Rated 5 out of 5 by Anonymous from Birthday gift My granddaughter picked this for her 21st birthday present. We are both very happy with the design, the quality and the feel of the item. Rated 5 out of 5 by Anonymous from Stunning My boyfriend bought me this for my 21st and I've fallen in love with it, it's stunning, sparkly and classy. Couldn't be happier with it, he did amazing. Even better in person too!